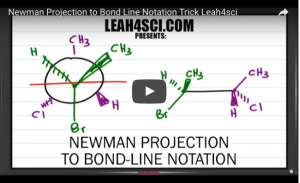 Newman projections provide you with a unique perspective of analyzing atomic interactions in a molecule. However, converting between Newman Projection and Sawhorse can be somewhat tricky. This video teaches you a quick shortcut for when you need to quickly convert between Newman to Sawhorse or Sawhorse to Newman. This is Video 5 in the Newman Projection Video Series. Click HERE for the entire series. This is so helpful!!! Thanks!!! !